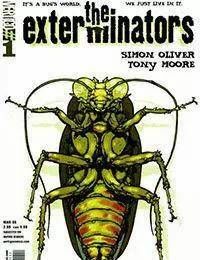 THE EXTERMINATORS centers on a dysfunctional group of bug killers prowling the barrios and bungalows of Los Angeles — the thinnest point on the shaky borderline between civilization and the violent chaos of nature. Henry James, the newest exterminator, sees the job as a means to cleanse the sins of his dark past. He has a hard time getting his view across to his careerist girlfriend, sociopathic partner, and the general bunch of freaks he calls co-workers. But what the “bug brothers” of Bug-Bee-Gone Co. don't understand is that human beings may be the atrue pests — and bugs could be the real exterminators.